It’s Luke’s first race review for VeloVoices – and he picked a good stage to start with! It was promised to be a day to shake up the GC. And in Stage 14 of Vuelta 2018, Simon Yates showed his climbing prowess once again as he rode away from the other GC hopefuls, who seemed more concerned about what others were doing than contemplating the stage win or the overall lead (looking at you, Nairo). Jesus Herrada lost the pace of the pure climbers almost as soon as they hit the final climb and conceded the red leader’s jersey to Yates. Simon Yates gets an honorable mention in today’s Rider of the Race discussion as he proved to be the most tactically savvy of the GC men. The young Mitchelton-Scott rider – remarkably still only 26 – appears to have learned from his over-exuberant attacking-at-every moment style at the Giro. Simon kept his wits about him as the likes of Steven Kruijswijk (LottoNL-Jumbo), Nairo Quintana (Movistar), and Miguel Angel Lopez (Astana) attacked up the mountain. He closed gaps when necessary and timed his final acceleration perfectly to leave everyone, even a charging Valverde, in his wake and solo to a remarkable stage win. There is no doubt that Yates earned himself today’s stage win, and the overall lead. Despite a beautiful stage win, however, Yates is not awarded Stage 14’s Rider of the Race. That honour goes to Steven Kruijswijk. The 31-year-old Dutchman attacked the group of favourites the moment the race reached the start of Alto les Praeres. He set a ruthless tempo, unable to be reeled in by Movistar’s Richard Carapaz and Alejandro Valverde despite their best efforts. Furthermore, he neutralised the oracular attacks of Quintana and Lopez, as well as others. Whilst one is left wondering if he could have been a stage contender had he conserved energy until later in the climb, his performance is undoubtedly the standout of the day. Again a hard finish! When you don’t try, you don’t know. Lastly, Cofidis and Jesus Herrada earn a special mention. Although it is not clear how it happened (my feed conveniently cut out during this point), Herrada and Cofidis found themselves on the wrong side of a split in the peloton. [Bahrain-Merida’s pace cooked them – ed] While others were able to rejoin, Herrada never refound the front and lost more than 9 minutes. What caught my eye, however, was that Cofidis never gave up. Even when the gap sat at more than 5 minutes, Cofidis had a full train at the front of the Herrada group. As he rode up the final climb, two of his Cofidis teammates rode with him. Herrada honoured the red jersey, and Cofidis honoured him. If that’s not beautiful, I don’t know what is. Thomas De Gendt has been a staple in breakaways at this year’s Vuelta. It seems as if any time that I turn on the television to watch, there he is. Casually pedalling along in the breakaway, in his bold red-and-white Lotto-Soudal kit. Commentators across the board believe that the bearded man is seeking to steal the KOM classification out from under Cofidis’ Luis Angel Mate. After today, he trails Mate by just 10 points. However, I have a different take. Every night, De Gendt tweets out photos of his dinner after the stage. If I’m not mistaken, he joked during the Tour that he was only riding the race for the post-stage meals. So, here’s my thought: De Gendt doesn’t really care about the KOM classification. Sure, it would make for a nice addition, but I think his real drive to get into so many breakaways, though, is to use as much energy as possible during the stage, and thus eat more of those delicious meals. You’re a wily one, Thomas, but I’ve cracked your secret. Once he and Lopez created a gap to the rest, Quintana seemed to be more concerned about being made to tow Lopez to the line rather than widening a gap to Yates. 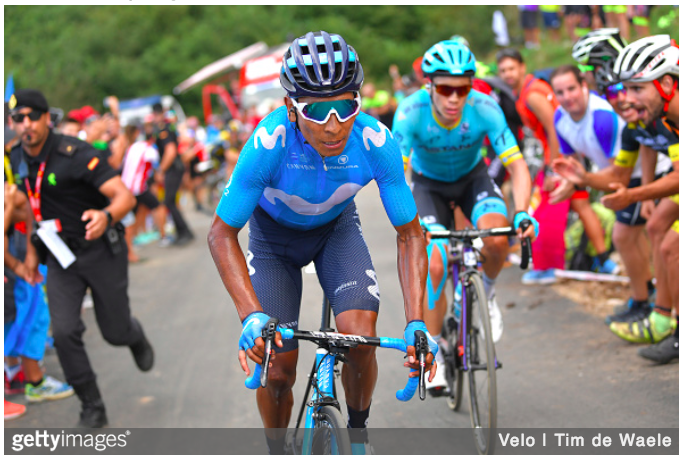 Similar to how he rode side-by-side with Yates up yesterday’s finishing climb, Nairo seemed to be unwilling to put substantive pace into today’s mountain. If you want to attack, Nairo, then do it! He often appeared to sit up, looking for Lopez to come through and contribute to the pace setting. Unfortunately for him, though, this allowed Yates to bring everyone to his back wheel. To add further insult to fans’ injury, once Quintana was back in the group within the final kilometre, he seemed completely uninterested in doing anything else! His concern for everyone else and his lack of “take the race by the horns” ambition lost him 7 seconds to Yates at the finish. He now sits in 3rd overall, 25 seconds off the lead.